Screen emulation is extremely acurate, so it can emulate border efects and even atribute efects. Supports TAP and TZX (both read and write) tape files, supporting normal speed loading and fast speed loading. Emulates joysticks: kempston, cursor and sinclair. Is distributed under GPLv3 license. 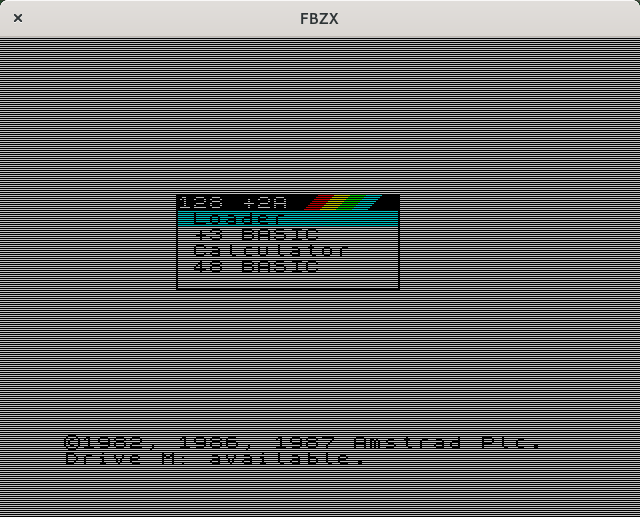 FBZX uses the SDL libpulse0 and libasound2 libraries, so you need them to be able to run the emulator (unless you recompile it; in that case you can choose which of them to use). Supports new TZX blocks, like "pause if 48K mode"
Direct compilation under BIG ENDIAN arquitectures (eg. PowerPC). Added the ability to create .TAP files and save to them. Added Interface I and Microdrive emulation (read and write). Added emulation of DELETE key. Added emulation of SNOW effect. Fixed a little bug in the fast-TAP loader. Fixed a speed problem when used without sound. Added support for TZX tape files. Fixed a bug in the file selector. Added right emulation of register R.
Added a digital low-pass filter to enhace the 48K sound. Now can be used without sound card (run it with '-nosound' parameter).